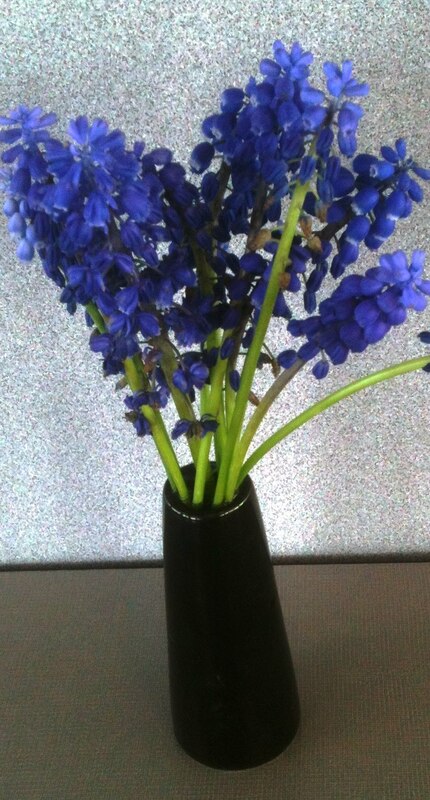 So how's the cut flower business, Earth Girl? It's been a tough spring. Comparing this year's deliveries to last year's deliveries, I lost several weeks of flowers due to the early blooms. For example, the pussywillows are usually good for several weeks of delivery, but this year they opened and matured within days! 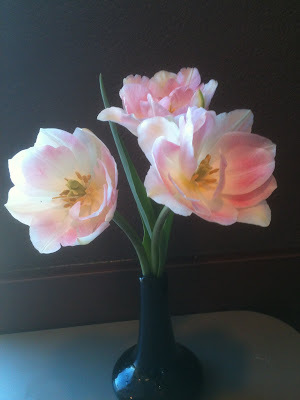 Another example is that the early, mid and late season tulips bloomed at the same time. 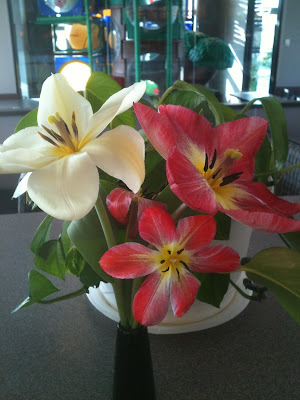 Now I'm trying to figure out when to plant the summer annuals, with the early warm weather but still a chance of frost. 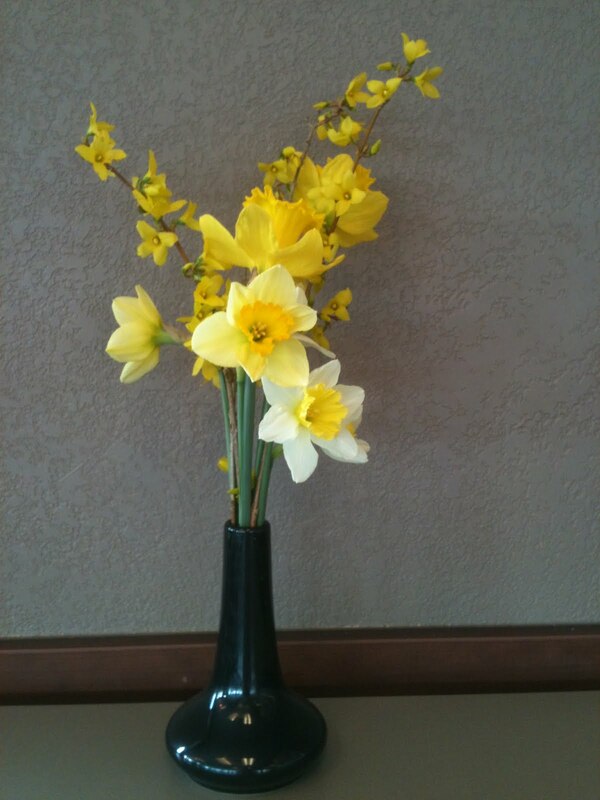 Forsythia and daffodils made a cheerful first delivery of the season of my field-grown cut flowers. The next delivery was tulips. These are especially lovely cut flowers as they open wide and then close at night. 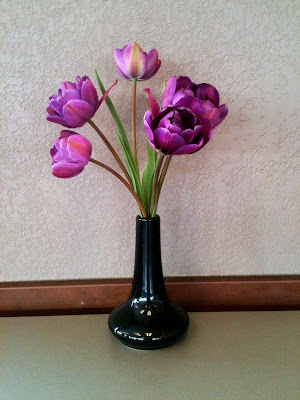 Usually when tulips open wide in a vase, they are at the end of their vase life. These are pictures of peony-flowering tulips. 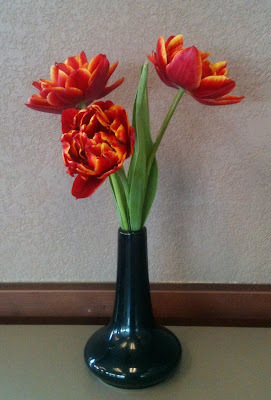 They have become one of my favorite tulips for cutting and create quite a bit of feedback from the restaurant's customers. Sunday evening as I was picking grape hyacinths, I walked into a redbud limb and it scratched my eye. The doctor put a patch over it yesterday and, reaching for my purse on the floor, I said, "This is going to affect my depth perception." Then I banged by nose on the arm of the chair, which I thought was much further away.